The 2002 thriller directed by Clint Eastwood is bound for Blu-ray in June. 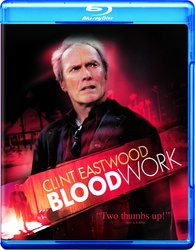 In an early announcement to retailers, Warner Brothers is readying 'Blood Work' for Blu-ray on June 5. FBI profiler Terry McCaleb almost always gets to the heart of a case. This time, that heart beats inside him. He’s a cardiac patient who received a murder victim’s heart. And the donor’s sister asks him to make good on his second chance by finding the killer. That’s just the first of many twists in a smart, gritty suspense thriller that’s “vintage Eastwood: swift, surprising and very, very exciting” (Jim Svejda, KNX/CBS Radio). Clint Eastwood produces, directs and stars in this edgy, acclaimed mystery based on Michael Connelly’s novel and scripted by Brian Helgeland ('L.A. Confidential'). With a superb cast brought to a hard boil playing characters to quicken your pulse and hold you spellbound, 'Blood Work' works exceptionally well. Specs and supplements have yet to be revealed, but suggested list price for the Blu-ray is 19.98. You can find the latest specs for 'Blood Work' linked from our Blu-ray Release Schedule, where it's indexed under June 5.